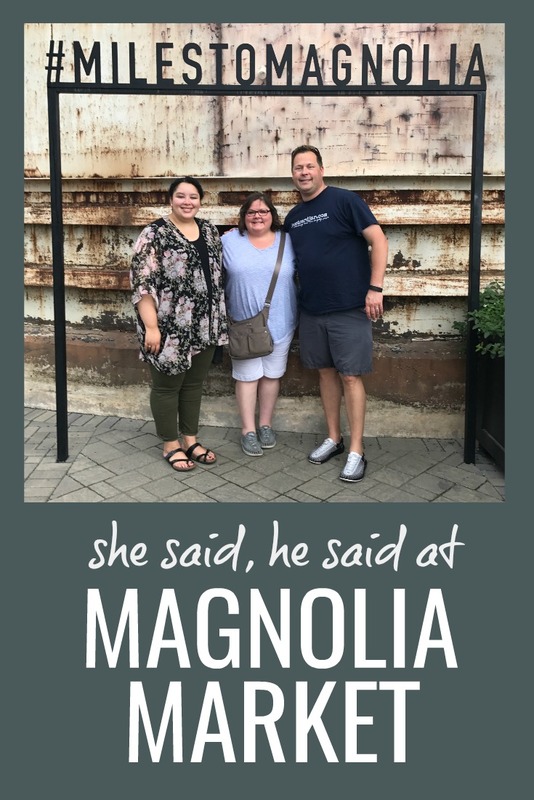 I’m still not quite sure how I convinced Steve to visit The Pioneer Woman Mercantile and lodge as well as Magnolia Market within 24 hours, but I did. 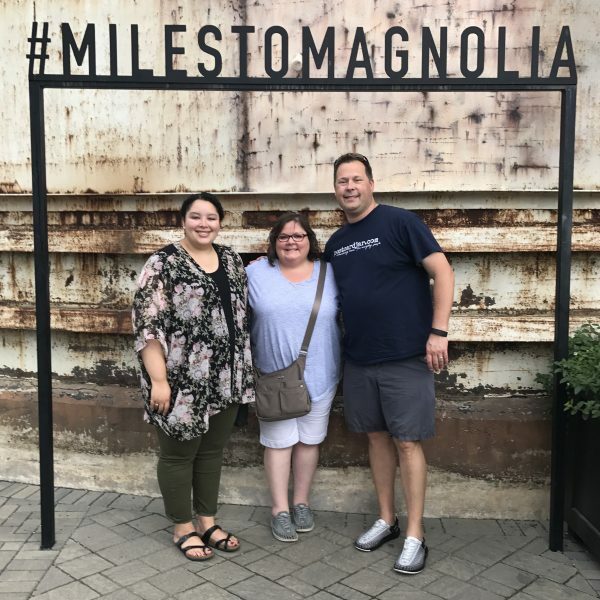 After spending two days in Pawhuska, Oklahoma, where he waited in line almost two hours for a taste of Ree Drummond’s chicken fried steak while I shopped for kitchen accessories, Steve drove our daughter, Meghan, and me to Waco, Texas. Steve: I’d just left my job as a school principal refereeing middle-school girl drama the day before only to find myself surrounded by middle-aged women going crazy for whisks and sprigs. Seriously, what was I thinking? I mean, the chicken fried steak was good, but how much can one man take? 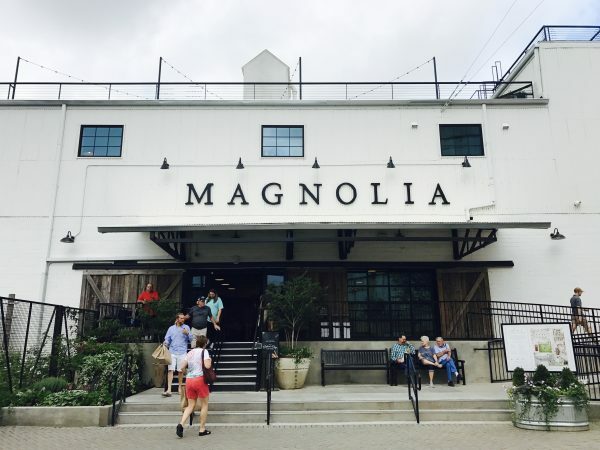 I had wanted to visit Chip and Joanna Gaines’ Magnolia Market for some time after watching their now Emmy-nominated home renovation and decorating show, Fixer Upper, on HGTV. Meghan, Ann and Steve in front of the silos at Magnolia Market. 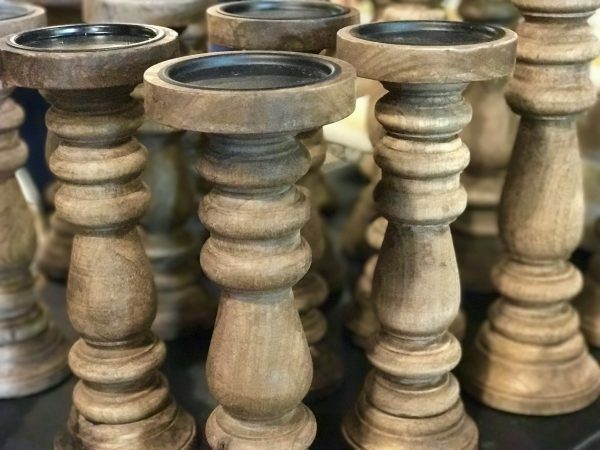 I had dreamed of walking into their meticulously organized home decor shop with stacks of wooden candlesticks, vases of flowers, and white washed shiplap walls. What the heck is shiplap? Is that a word? When we arrived in Waco, we made our way toward the now famous silos and began to look for a place to park. We found a great spot just a block or two away at the First Baptist Church parking lot. They charged what I thought was a very reasonable $10 for the day. 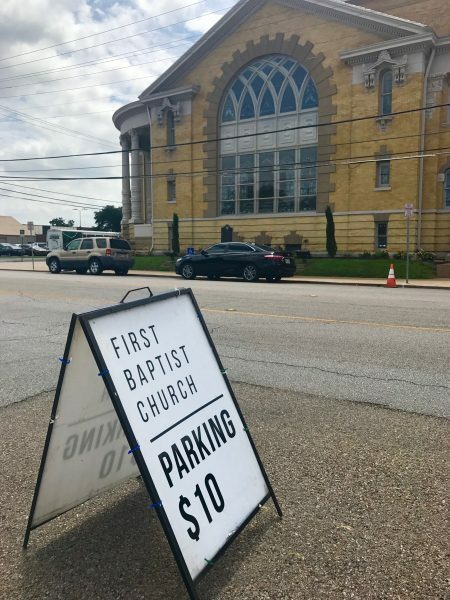 First Baptist Church offered $10 parking in the church lot near Magnolia Market. Ten dollars? It’s not like it’s a Nebraska football game or anything! 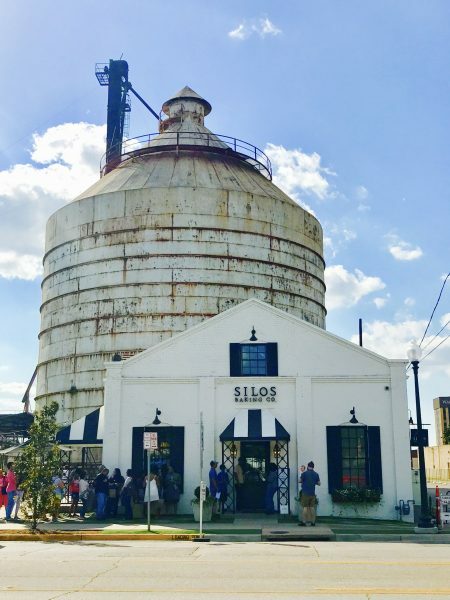 Our first stop on the hallowed ground was at the newly renovated Silos Baking Co. building. It was absolutely adorable from the outside and I was so excited to get in line and wait our turn for a glimpse at the interior. I bribed Steve to join me in line with a promise of a cupcake at the end. Not another line! Fool me once, shame on you. Fool me twice, shame on me. I mean, I like a cupcake, but let’s be honest, it’s not a chicken fried steak. Despite his reluctance, he agreed to wait in line with me (again) and eventually, we made our way into the sweetest little cupcake shop I’ve ever seen. 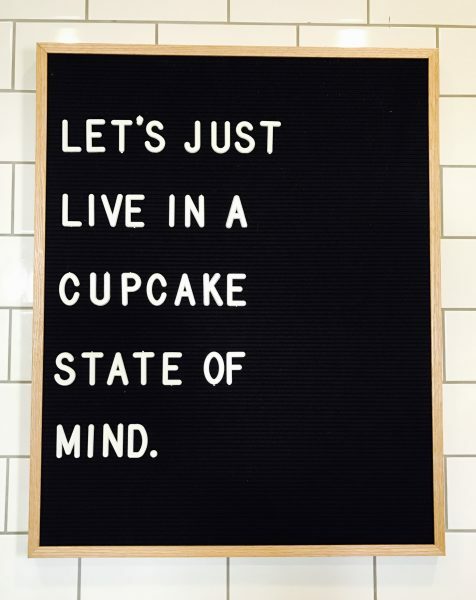 Loved this letter board sign on the wall at Silos Baking Co. It was just like I remembered on TV — glossy white subway tile, black industrial shelving, and perfectly laid herringbone flooring. It was beautiful. What did she think I was going to do? I’d already paid the Baptists $10 to park. I was getting a cupcake. And the Prize Pig bacon and cheddar biscuit. Eventually, we did get inside and each of us ordered a cupcake. I selected a Strawberries & Cream cupcake piled high with rich, pink, vanilla buttercream icing. Meg had the Lemon Lavender cupcake while Steve ordered the Silobration cupcake which was a vanilla cupcake with chocolate frosting and sprinkles. The Shiplap cupcake and garnish looked amazing, as well. 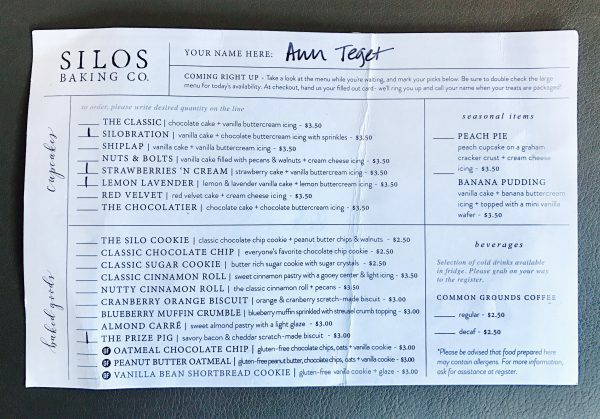 The menu at Silos Baking Co. The shiplap cupcake is vanilla cake with vanilla buttercream icing. Okay. 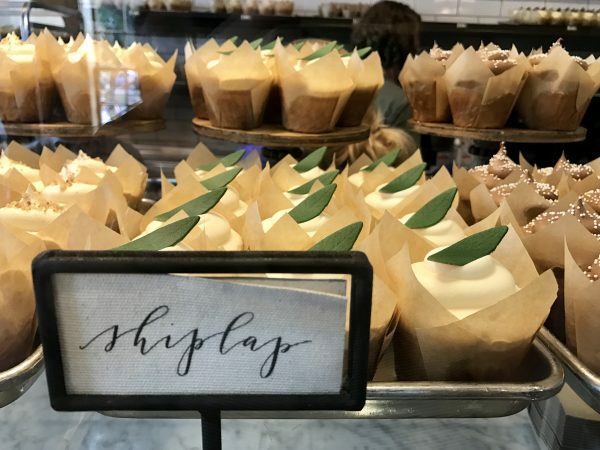 There is a shiplap flavored cupcake? Now I’m completely confused. Of course, before we left the bakery, I had to check out the bathroom and see how it compared to the one at the Mercantile back in Pawhuska. 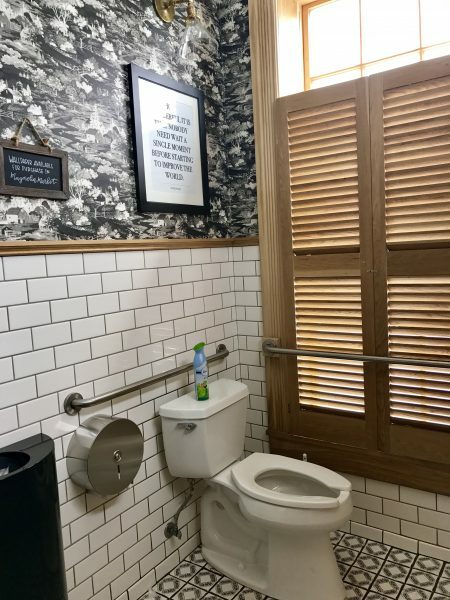 It was just as well designed and included gorgeous black and white wallpaper, more white subway tile, and nicely framed inspirational quotes–all the things I love to see in a well decorated bath. No Charmin toilet paper here, but I was glad to see they had Febreeze on the back of the toilet, if you know what I mean. The bathroom in the Silos Baking Company. After finishing our cupcakes on the outside patio, we began our ascent to The. Magnolia. Market. I was like a kid on Christmas morning, anxiously anticipating the wondrous gifts that awaited me inside. The front view of Magnolia Market in Waco, Texas. I had imagined the rich colors and textures of the rugs and blankets as well as the decorative lanterns and wall hangings that would surely adorn the shelves inside. I had my budget and my list and I couldn’t wait to go inside. But two steps into the front door, I found something unexpected. Sadly, ivory colored candles and Clint Harp designed spindles did not immediately come into view. All I saw were women. Lots of women. 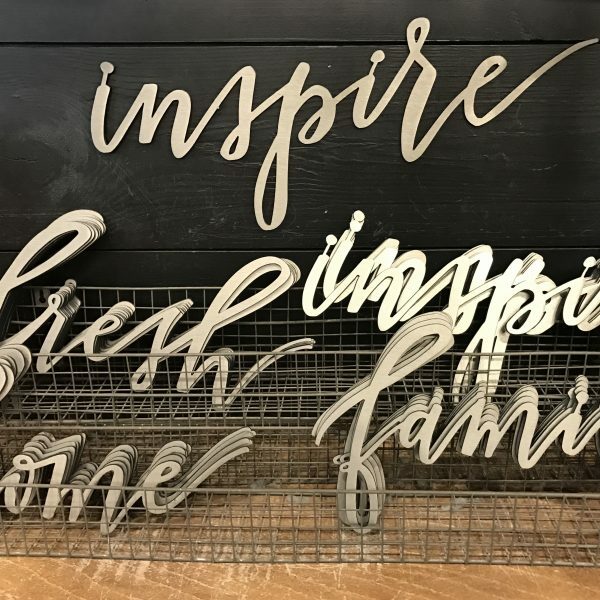 And they were all frantically looking around, holding up various items and asking each other which would look better on their farmhouse table — the white sugar mold tray or the metal trough with wooden handles? They had armfuls of floral stems and seagrass baskets and Joanna’s leather totes draped over their shoulders. As much as I love home decor, and believe me, I love home decor, it was a lot even for me. 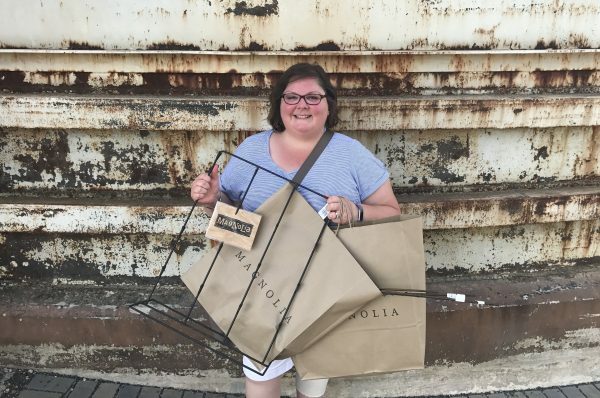 However, I was determined to find a few of the items I’d seen on Fixer Upper and spend at least some of the Magnolia Market gift card Steve had gotten me for my birthday the month before. 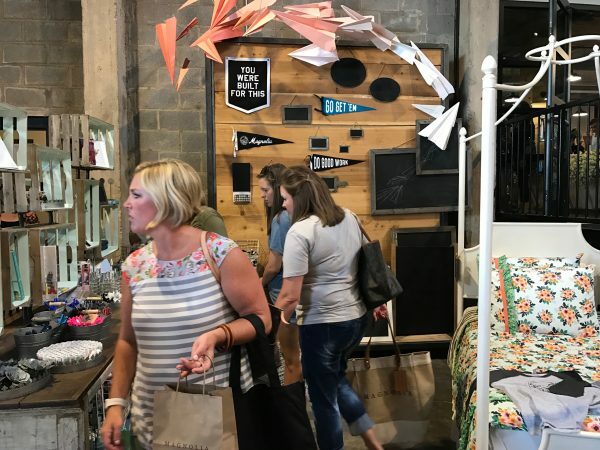 Shoppers seeking that perfect home decor item at Magnolia Market. Wooden spindle candlesticks at Magnolia Market. Staying together was obviously a lost cause, so Steve, Meghan, and I decided to separate and meet back near the front door in 20 minutes. Steve began a search for what he calls a “man chair” where he could sit and wait. Finding none, he ventured over to Chip’s Corner while I began to look around. I admired the handcrafted wooden serving trays, Jimmy Don’s metal signs, and the simplistic colors of all of the throw pillows Joanna had seemingly designed. Tell me the difference again between a throw pillow and a sham. It really was a beautiful store. 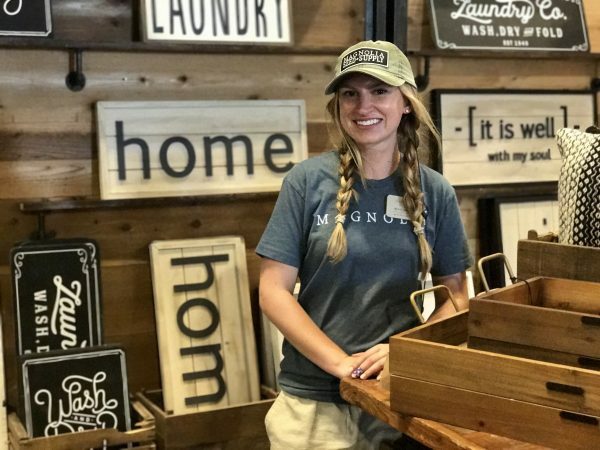 Everything was there … the vintage seltzer crates, dozens of metal baskets, row after row of decorative flowers and all kinds of vintage metal letters that have become a signature design element for Joanna Gaines. I was in home decor heaven. Look at these pictures. Would you look at them? Some of the many floral stems at Magnolia Market. 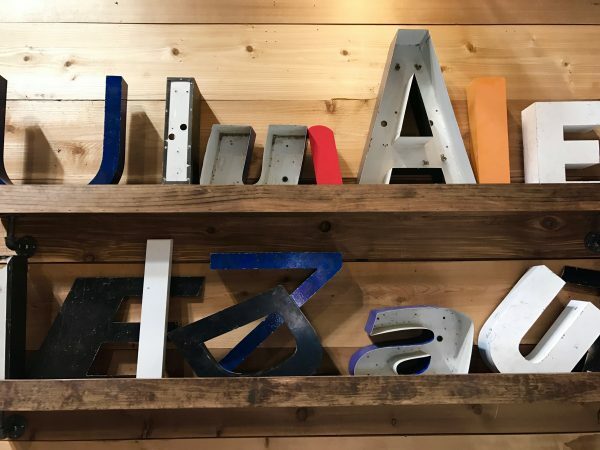 Decorative lettering at Magnolia Market. 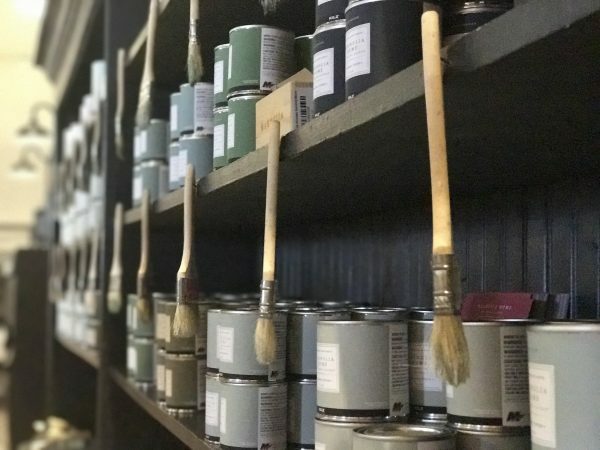 Paint colors are displayed on paintbrushes at Magnolia Market. 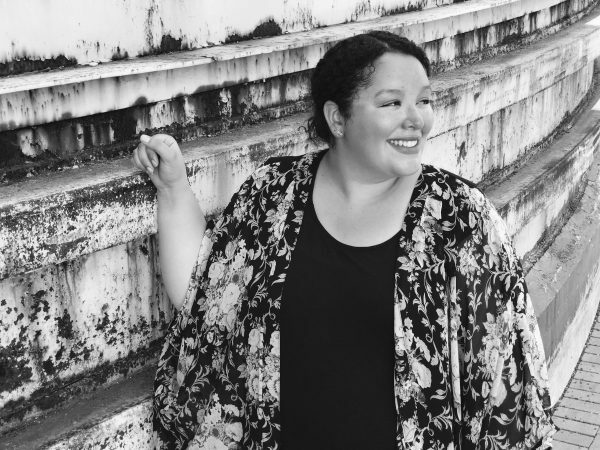 I made my way through the crowds of people women and found the items I was hoping to see — the signature Magnolia wreath, wooden pillar candle sticks, and the Aspen leaf stems I’d been unable to find back home. 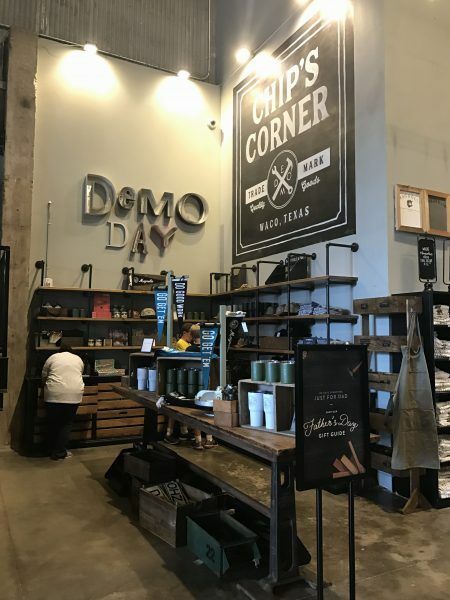 Chip’s Corner at Magnolia Market. 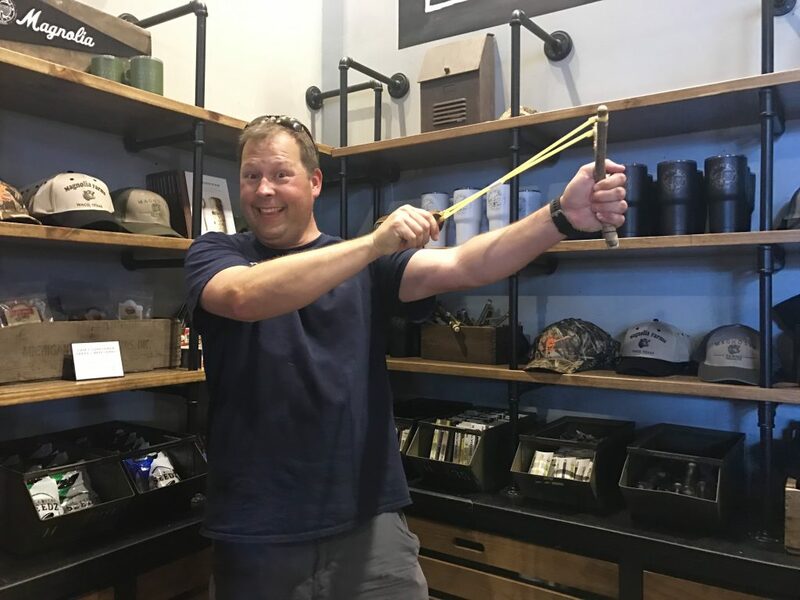 Even though it seemed to be moving quickly, I took one look at the long line at the checkout counter and decided that it might be best to come back later in the day to make our purchases. Praise the Lord! I didn’t have to stand in another line! We left the main store and ventured out back to a plaza-like family play area. People were lounging around at picnic tables, playing yard games with their kids, and enjoying the swings under the sunny Texas sky. And, we were surrounded by food trucks! Things were looking up! 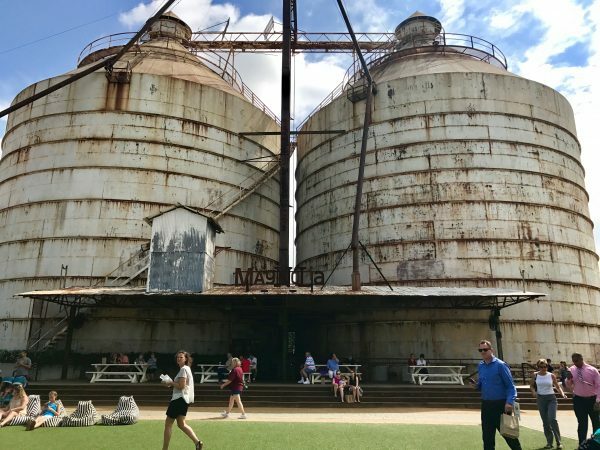 The iconic silos at Magnolia Market. We grabbed an iced coffee from the Common Grounds food truck and found a shady spot to people watch for a bit. It was nice to see so many local restaurants have a chance to get in on a piece of the action by bringing their food trucks right onto the site. Club Sandwich, Milos, Co-Town Crepes, and Chuck’s Gourmet Popcorn all had spots near the lawn and visitors were able to enjoy a bite to eat and just chill out. The plaza area behind the store where families and people could hang out. 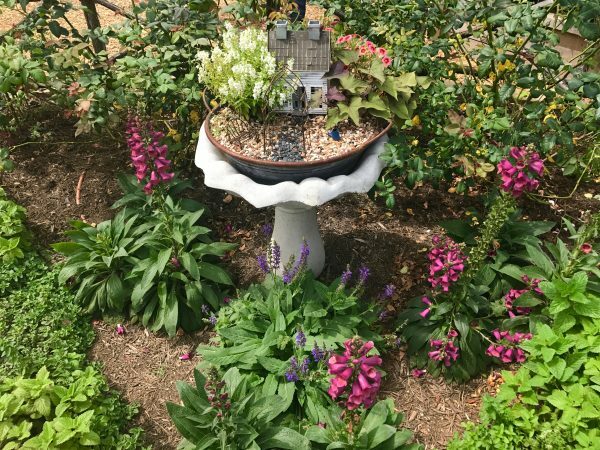 After our refreshing beverage, we made our way over to the Magnolia Seed Supply shop where we walked through luscious garden beds filled with flowers, vegetables and herbs and even a fairy garden or two. Umm … I’m not even going to ask. 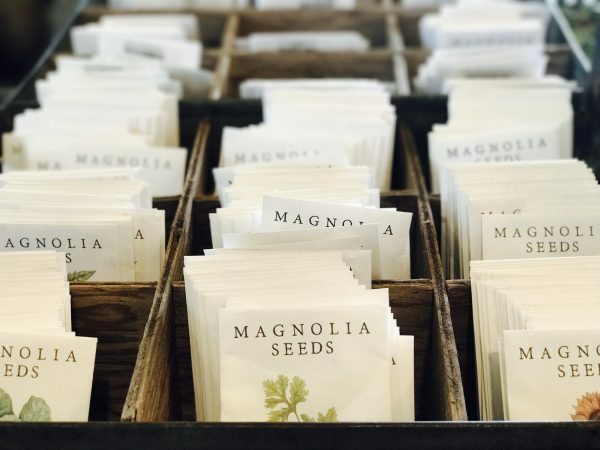 Magnolia Seed and Supply has beautiful gardens with flowers, vegetables and herbs. 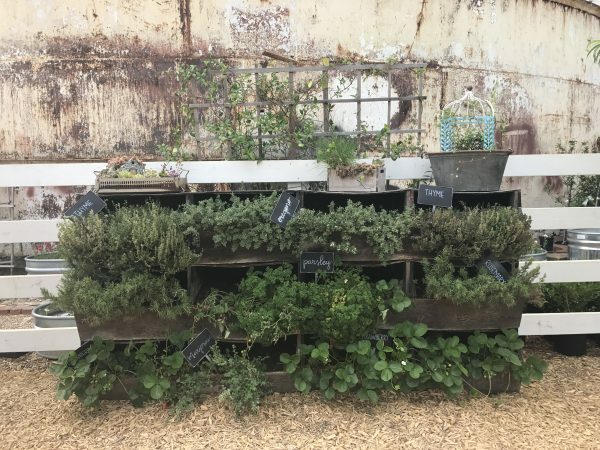 I loved smelling all of the fresh herbs and admiring the succulents which were displayed in such beautiful ways. 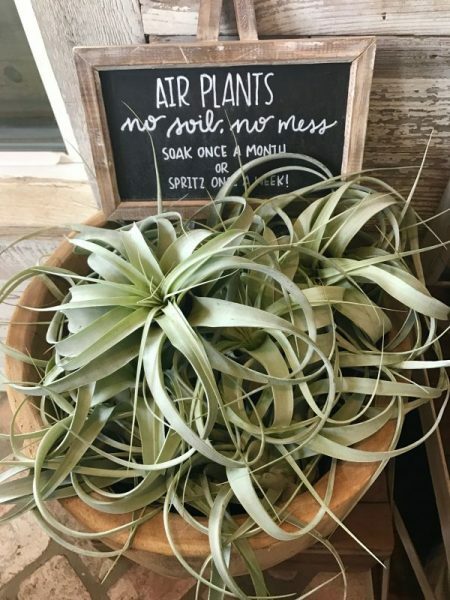 There are lots of air plants available for sale at Magnolia Seed & Supply. We purchased a few seed packets and a gift for my sister who has a newly-found love of gardening and then made our way back outside and down the street to the church parking lot. Loved these cute seed packets and plan to plant them in our garden boxes back home. 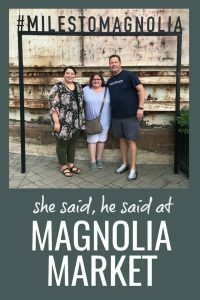 We spent the afternoon on a fantastic tour of the town with Waco Tours (more about that coming soon) and returned to Magnolia Market an hour or so before closing to make our purchases. I’m so glad we did. The crowds are far smaller late in the day at Magnolia Market. 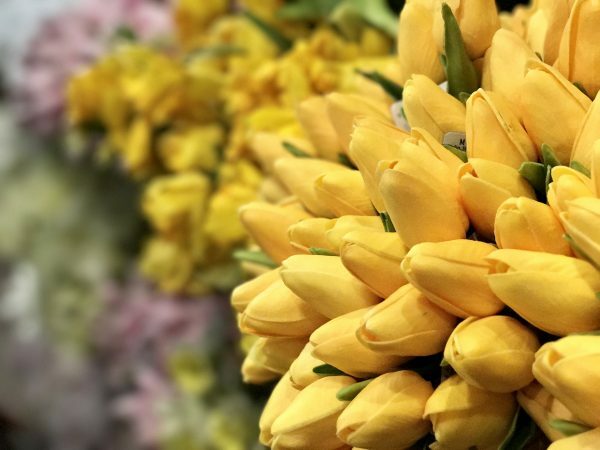 By that time, the crowds had dwindled and I was able to walk around the store with ease, oohing and ahhing over floral stems and glass jars, and visiting with several of the sweet employees who now had even more time to make us feel at home. One of the friendly, helpful employees at Magnolia Market. I can’t even begin to tell you how much nicer it was near closing time. It was a much more relaxed atmosphere. And we were able to park on the street for free! I found just the things I had come there to buy and right as I was about to check out, noticed a standing metal photo and card holder on the sale table! It was perfect for displaying our postcards so I added it to my pile. Loved this metal card and photo holder we found on the sale table. I’m pretty sure I’ve also seen a stand like that used by street vendors to display individual size packs of potato chips. Just sayin’. We left the store just before closing time and took a few minutes to admire the outdoor spaces with far fewer people around. It was nice. 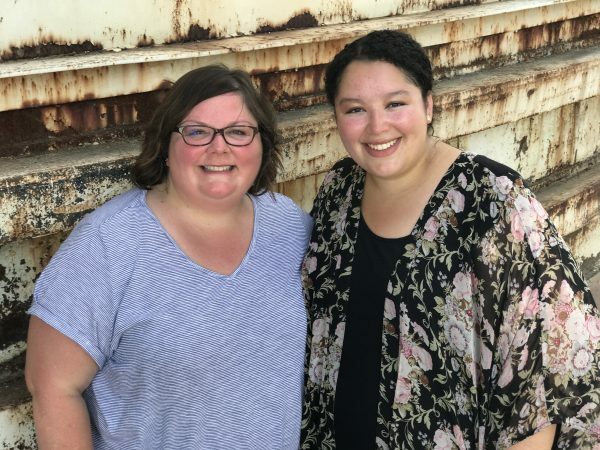 We snapped some photos near the Silos and took it all in. I’d had a great day in Waco. 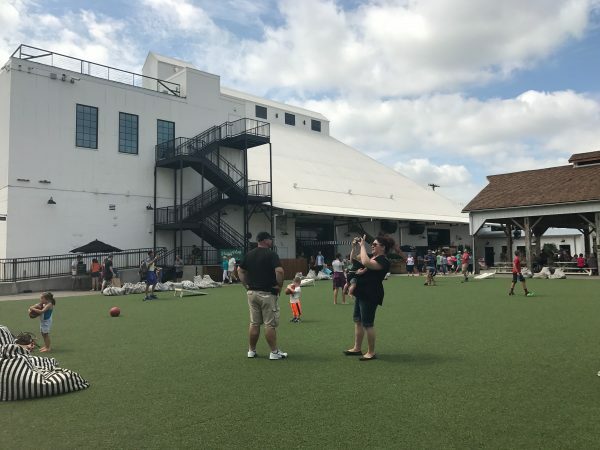 I couldn’t help but think about Chip and Joanna Gaines and how their love of family, community, and each other had inspired them build this amazing place that had become a bucket-list destination so many. 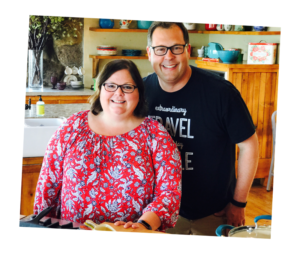 It reminded me of the love I have for my own family and their continued willingness to do special things for me, like taking me on a pilgrimage across four states to look at home decor. In the Gaines’ book, The Magnolia Story, they wrote that “there may be nothing greater than a life well loved.” I couldn’t agree more. And even though Steve can be quite a smarty pants at times, I always know how much I am loved. 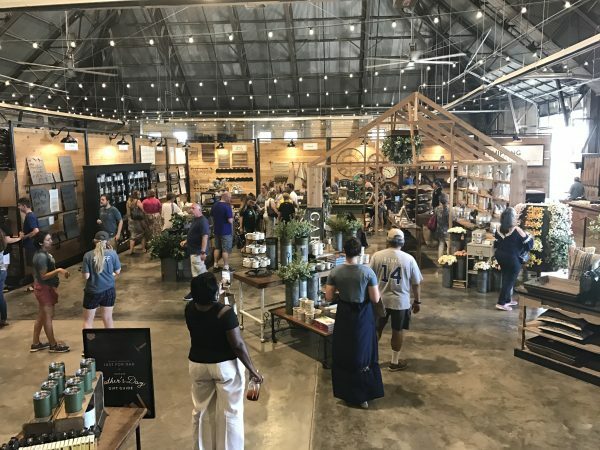 Have you been to Magnolia Market in Waco? What did you think? Let us know, we’d love to hear from you. She said, he said at Magnolia Market in Waco, Texas. Loved reading this! You were right on the money. I dragged Craig there recently, the only addition I would make is that Texas is freaking HOT! I did enjoy, I love Chip and Jo, I just don’t think I need to ever go back. I really enjoyed your He Said, She Said post! What a well thought out blog about your Magnolia (aka Mecca!) adventure! 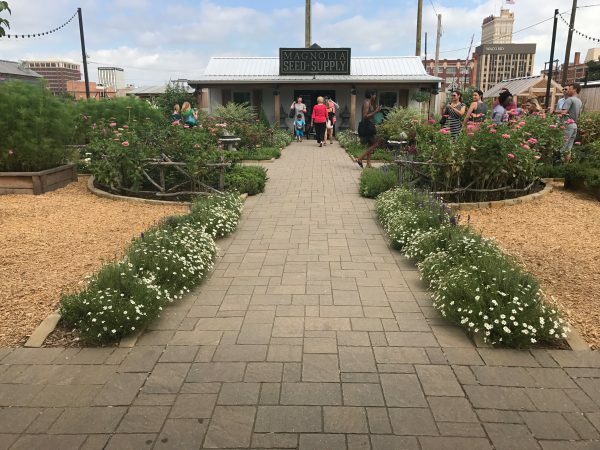 Magnolia Market is on my bucket list. Wow! It amazes me that in such a short amount of time the Gaines’ have built their little “Maggie” into such a destination. I do wish that I could afford to stay in their 1800’s Victorian B&B, but at a grand a night, that just ain’t happening. If I had 7 friends that’d be willing to take the trip, the price wouldn’t seem insurmountable. Alas, as I said, it isn’t going to happen in my lifetime. I don’t know if they open it for tours, but if they did, did you take a tour? Sadly, we did not see it. Like you, I think it would be fun to get a group trip together and have everyone share the cost. Sounds like it would be an amazing stay. Unless of course, we win the lottery … 🙂 Thanks for reading our blog. I hope you’ll follow along on some of our other journeys and stay in touch. OH MY GOODNESS! What a GREAT combination of personalities in the writing. I loved walking through Magnolia with you Ann as I live in Canada and it will be a LONG time before I am able to cross that off MY bucket list…and Steve..wow..I could hear so many men’s sentiments in your quips. You are soooooo sweet. Thanks for taking the time to write to us and for all your kind words. They mean a lot to us. We are so happy you enjoy our posts and hope you’ll keep in touch and let us know what you’d you’d like to see on Postcard Jar. Again, thank you so much for your thoughtfulness. May God bless you, as well. Loved reading this…both Dan and I read it and laughed out loud! This would be us….when we go…hopefully soon!!! Thanks, Megan. We had a lot of fun writing it together. Thanks for the kind words, glad you enjoyed the post. Be honest. Do you know what shiplap is?